The two most feasible methods for making such replacements are: direct fits- installing LED bulbs that work with existing fluorescent ballasts, and bypass- wiring the internal driver of the LED to the main voltage (bypassing the outdated fluorescent ballast). Direct fits (or instant fits) is a “plug and play” method for replacing fluorescent bulbs with LEDs. 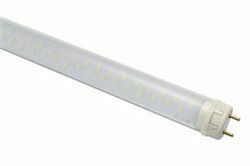 In this option, the LED tube is equipped with an internal driver that allows it to work with existing fluorescent ballasts. As a result, you would simply have to switch out the bulbs during replacement. No wiring or readjusting is required, making this option suitable for facilities that don’t have a lot of time to spend on upgrading their current lighting system. It is also ideal for businesses that are testing various lighting configurations. Operators can easily adjust energy consumption and light levels using the existing ballast. Transitioning to LED technology is a straightforward process when using direct fits. Companies can stop stocking up on fluorescent tubes, and start purchasing LED lights. There are several reasons why direct fits may not be appropriate for a particular location. Facilities with very old fluorescent ballasts that are nearing the end of their lifespan will have to consider unforeseen maintenance costs. In some cases, the establishment’s current fluorescent fixtures are not compatible with LED tubes. For example, initially some LED tubes were only compatible with instant start electronic ballasts. Because the ballasts were not originally created for LEDs, businesses may also run into efficiency issues in the form of power loss from integration and inconsistent dimming functionalities. Bypassing the existing fluorescent ballast and wiring the LED’s internal driver to the main voltage might be advantageous for businesses that are interested in long-term lighting solutions. The replacement process requires an individual to remove the ballast from the unit, and the sockets are connected directly to the line voltage via wires. In this configuration, one socket serves as support to keep the light in place, while the other socket is wired in the line voltage. For shunted sockets, individuals will have to replace the line voltage socket with a non-shunted socket. “The reason T8 LED requires non-shunted sockets is that the LED lamp is single end-powered. With shunted sockets, they work with fluorescent because you can utilize sockets on both ends of the fixture to complete the circuit, but with LED you’d be forced to put live AND neutral into the same side of the same socket, which would not work,” explained ALB Energy Solutions. The benefits of rewiring an existing fluorescent fixture are numerous. Power loss is kept minimal, because no power is wasted in the ballast (this also makes the LEDs more efficient). Additionally, by removing the ballast from the configuration, businesses can reduce maintenance costs. Outdated ballasts that are prone to breakage will not need to be replaced. Companies with a team of lighting specialists could make the modifications without help from a third-party service. Such modifications include removing the ballasts, replacing the sockets and making various wiring connections. The most expensive (and most reliable) option for transitioning to LEDs is installing an LED tube with an external driver, which powers the lights. Like bypassing, this configuration requires the ballasts to be removed. However, instead of connecting the low-voltage driver to the line voltage, it is hooked up to the sockets. Using a remote driver is useful for businesses that want to transition to LEDs, but are facing compatibility issues with their current fluorescent lamps. This method is designed to work with most fluorescent fixtures available in the market today. Establishments that have complex lighting requirements, such as dimming, may also benefit from using external drivers; since they work seamlessly with most lighting control systems.